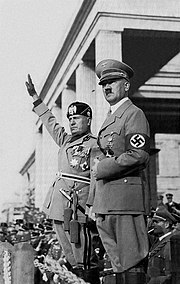 Italian Fascism was copied by Adolf Hitler's Nazi Party, the Russian Fascist Organization and the Romanian National Fascist Movement (the National Romanian Fascia and National Italo-Romanian Cultural and Economic Movement), whereas the Dutch fascists were based upon the Verbond van Actualisten journal of H. A. Sinclair de Rochemont and Alfred Haighton. The Sammarinese Fascist Party established an early Fascist government in San Marino, their politico-philosophic basis essentially was Italian Fascism. In the Kingdom of Yugoslavia, Milan Stojadinović established his Yugoslav Radical Union, which was based on Fascism. Party members wore green shirts, Šajkača caps and used the Roman salute. Stojadinović also took to calling himself Vodja. In Switzerland, pro-Nazi Colonel Arthur Fonjallaz of the National Front became an ardent Mussolini admirer after visiting Italy in 1932 and advocated the Italian annexation of Switzerland, whilst receiving Fascist foreign aid. The country was host for two Italian politico-cultural activities: the International Centre for Fascist Studies (CINEF ��� Centre International d’ Études Fascistes), and the 1934 congress of the Action Committee for the Universality of Rome (CAUR — Comitato d’ Azione della Università de Roma). In Spain, the writer Ernesto Giménez Caballero, in Genio de España (The Genius of Spain, 1932) called for the Italian annexation of Spain, led by Mussolini presiding an international Latin Roman Catholic empire. He then progressed to be closely associated with Falangism, leading to discarding the Spanish annexation to Italy.